After we Christians have been “Raptured” or “Caught Up in the Air,” and while we are in Heaven at the Bema Seat Judgment (Jesus will look at what we did for Him after we were saved and give us our crowns that we will gladly lay at His feet) and experiencing the Marriage Supper of the Lamb, those left on earth will be experiencing tribulation such as the world has never seen – “For then shall be great tribulation, such as was not since the beginning of the world to this time, no, nor ever shall be.” (Matthew 24:21) These times are to convince man to turn to Salvation through Jesus, so those who are already saved and have been caught up to Jesus, of course, will not go through this. I suggest one read the uncorrputed truth from the uncorrupted King James Version Bible. All the others are man-made and have twisted and changed words, as well as deleted many words from their versions. If you want pure, unadulterated truth, go to the KJV Bible. 2. The Anti-Christ’s Rise – The anti-Christ will sign a 7-year covenant of peace with Israel (Daniel 8:25; 1 Thessalonians 5:3). He will break that covenant in the midst of “the week” (after 3 1/2 years) and shall sit in the temple, controlling the world and declaring that he is God. This event is called the “abomination of desolation” in Matthew 24:15; Mark 13:14. The anti-Christ is described in further detail in 2 Thessalonians 2:3-10; Daniel 8:23-25. 3. Temple in Jerusalem Rebuilt – This is told in Ezekiel 40-48. Note the existence of the temple at the midway point of the tribulation in 2 Thessalonians 2:4. 4. God’s Two Witnesses Begin to Preach – “And I will give power unto my two witnesses, and they shall prophesy a thousand two hundred and threescore days, clothed in sackcloth.” (Revelation 11:3) This 1,260 days is 3 1/2 years. 5. Book with Seven Seals is Opened – Each seal reveals something that will happen on earth. This is told in Revelation 5.
a. First Seal – “And I saw when the Lamb opened one of the seals, and I heard, as it were the noise of thunder, one of the four beasts saying, Come and see. And I saw, and behold a white horse: and he that sat on him had a bow; and a crown was given unto him: and he went forth conquering, and to conquer.” (Revelation 6:2) The anti-Christ begins to rule. b. Second Seal – “And when he had opened the second seal, I heard the second beast say, Come and see. And there went out another horse that was red: and power was given to him that sat thereon to take peace from the earth, and that they should kill one another: and there was given unto him a great sword.” (Revelation 6:3, 4) Peace is taken from the earth and replaced by a great sword (possibly a reference to the previously mentioned war in Ezekiel 38-39). c. Third Seal – “And when he had opened the third seal, I heard the third beast say, Come and see. And I beheld, and lo a black horse; and he that sat on him had a pair of balances in his hand. And I heard a voice in the midst of the four beasts say, A measure of wheat for a penny, and three measures of barley for a penny; and see thou hurt not the oil and the wine.” (Revelation 6:5, 6) A world-wide famine. d. Fourth Seal – “And when he had opened the fourth seal, I heard the voice of the fourth beast say, Come and see. And I looked, and behold a pale horse: and his name that sat on him was Death, and Hell followed with him. And power was given unto them over the fourth part of the earth, to kill with sword, and with hunger, and with death, and with the beasts of the earth.” (Revelation 6:7, 8) One-quarter (1/4th) of those living on earth are killed. e. Fifth Seal – “And when he had opened the fifth seal, I saw under the alter the souls of them that were slain for the word of God, and for the testimony which they held: And they cried with a loud voice, saying, How long, O Lord, holy and true, dost thou not judge and avenge our blood on them that dwell on the earth? And white robes were given unto every one of them; and it was said unto them, that they should rest yet for a little season, until their fellowservants also and their brethren, that should be killed as they were, should be fulfilled.” (Revelation 6:9-11) The martyrdom of believers on earth. 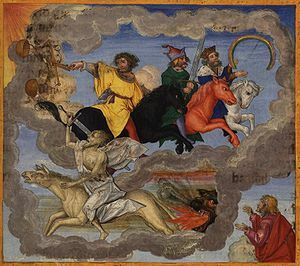 f. Sixth Seal – “And I beheld when he had opened the sixth seal, and, lo, there was a great earthquake; and the sun became black as sackcloth of hair, and the moon became as blood; and the stars of heaven fell unto the earth, even as a fig tree casteth her untimely figs, when she is shaken of a mighty wind. And the heaven departed as a scroll when it is rolled together; and every mountain and island were moved out of their places. And the kings of the earth, and the great men, and the rich men, and the chief captains, and the mighty men, and every bondman, and every free man, hid themselves in the dens and in the rocks of the mountains; and said to the mountains and rocks, Fall on us, and hide us from the face of him that sitteth on the throne, and from the wrath of the Lamb: for the great day of his wrath is come; and who shall be able to stand?” (Revelation 6:12-17) A great earthquake, changes in the sky. g. God’s Mark and Seal on His Own – “And I looked, and, lo, a Lamb stood on the mount Sion, and with him an hundred forty and four thousand, having his Father’s name written in their foreheads. And I heard a voice from heaven, as the voice of many waters, and as the voice of a great thunder: and I heard the voice of harpers harping with their harps: and they sung as it were a new song before the throne, and before the four beasts, and the elders: and no man could learn that song but the hundred and forty and four thousand, which were redeemed from the earth. These are they which were not defiled with women; for they are virgins. These are they which follow the Lamb whithersoever he goeth. These were redeemed from among men, being the firstfruits unto God and to the Lamb. 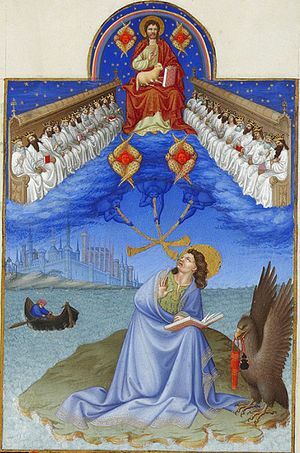 And in their mouth was found no guile: for they are without fault before the throne of God.” (Revelation 14:1-5) Following the opening of the Sixth Seal, God marks his children on their foreheads and seals 144,000 who will be witnesses for Him. These 144,000 are Jews – Revelation 7:1-8 – Twelve thousand from each of the twelve Tribes of Israel. h. Seventh Seal – This part of the sealed book reveals seven angels, sounding seven trumpets of Judgment. This is all told in Revelation 8:1 – 11:19.
v. Fifth Trumpet – Revelation 9:1-12 Hideous satanic demons torment unbelievers on earth for 5 months. John saw “a star fall from heaven unto the earth.” This star refers to an unidentified demonic being, perhaps even Satan. Jesus spoke of a fall of Satan (Luke 10:18), as did Isaiah (Is. 14:12). The “bottomless pit” is the residence of the anti-Christ before he appears on earth (Revelation 9:1; 11:7) and the place where Satan is bound during the millennium (Revelation 20:3). It appears to be a place for the imprisonment of demons (Luke 8:31). The locusts represent demonic forces that are released and allowed to torment and bring judgment upon unrepentant humanity (see also Joel 2:1-12, 25). The king of the locusts is the “angel of the bottomless pit” (Revelation 9:11). Abaddon (Hebrew) and Apollyon (Greek) mean “the destroyer,” one of the names for Satan. vi. Sixth Trumpet – Revelation 9:13-21 depicts how 1/3 of all men will be killed in a war such as this world has never witnessed. An army of two hundred million is described as killing a third of mankind. This inconceivably large force–more than the entire population of the earth at the time Revelation was written–is beyond human comprehension. Many see this as an actual army, while some identify this language as symbolic of a demonic host. In any case, the outpouring of suffering and death at the sounding of the fifth and sixth trumpets seems terrible; yet its purpose is merciful. It is designed to encourage people to repent before it is too late to do so. 6. The Beast and False Prophet Rise – The Beast is the one-world political leader. The False Prophet is the one-world religious leader. These will rise to full prominence and control the entire world. (Revelation 13) The Beast rises up out of the sea, which indicates that the anti-Christ may emerge from a situation of political chaos (Isaiah 7:20). John’s description of the Beast is similar to his description of Satan (Revelation 12:3), indicating a close relationship between the two. The Beast derives his power, rule, and authority directly from Satan (Revelation 13:3). 7. The Gospel is Preached to All the World – “And I saw another angel fly in the midst of heaven, having the everlasting gospel to preach unto them that dwell on the earth, and to every nation, and kindred, and tongue, and people,” (Revelation 14:6) See also Matthew 24:14. All the way down to the last millisecond, God is showing great mercy to give any and all still another chance to repent and come to Him. He does not wish to cast anyone into Hell. That place has always been meant for satan. It is too bad that so many will listen to satan and join him there. f. Sixth Vial – “And the sixth angel poured out his vial upon the great river Euphrates; and the water thereof was dried up, that the way of the kings of the east might be prepared.” (Revelation 16:12) See also verses 13-16. This is the preparation for the Battle of Armageddon. g. Seventh Vial – “And the seventh angel poured out his vial into the air; and there came a great voice out of the temple of heaven, from the throne, saying, It is done. And there were voices, and thunders, and lightnings; and there was a great earthquake, such as was not since men were upon the earth, so mighty an earthquake, and so great.” (Revelation 16:17, 18) See also verses 19-21. This will be the greatest earthquake ever, bringing about the destruction of the one-world religious system (Revelation 17) and the one-world political and commercial systems (Revelation 18). Reblogged this on Truth and Love from God's Word.